Bronze arrowheads occur with various frequency in Europe due to the continent’s great, reciprocal history, cultural differences and different armaments. In some European regions, bronze arrowheads are rare. The few finds in some European regions do not allow for the renouncement of the bow as a hunting or war weapon, but rather as a modified burial furnishing. During the Late Bronze Age and the beginning of the Iron Age, archers were placed lower in society. The recruitment of simple archers in European armies also led to a neglected position within the armed forces. Like the slingers with their stones or almond-shaped lead missiles, the archers came from simple and poor social conditions, and these warriors could not afford elaborate burials. Therefore in warrior burials, often only swords, spearheads, daggers, jewelry and ceramics are found. Rarely are bronze arrowheads found, but they can, however, accumulate massively depending on the region. For the Sarmatians and Scythians, bows were frequent furnishments of male tombs, because the bow was the standard weapon for the general armament of these equestrian tribes. Bronze arrowheads are often documented without any find context, which indicates their use in hunting. In a warlike context, more stray finds may appear in an area, which often makes it impossible to determine their origin due to a lack of associated finds. In Western and Southern Europe, bronze arrowheads mainly appear in former settlements. The Bronze Age is divided into different periods. Within Europe, the introduction and development of bronze proceeded in different steps. The influence of foreign cultures brought different developmental shifts in Europe, so a uniform Bronze Age period cannot be assumed. Along with rivers and trade routes, the development of the region as a whole was faster than the development of remote regions, such as the mountainous regions of Iberia. 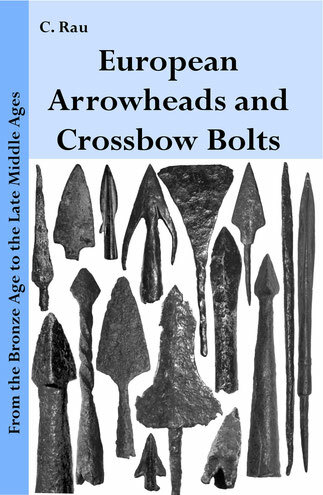 Due to the rare use of metals for arrowhead production, this book begins from the Middle Bronze Age; in the Early Bronze Age, bronze arrowheads were rarely produced. Only in the Middle Bronze Age were arrowheads regularly made of bronze. For centuries, bone and obsidian remained the main raw materials used to produce arrowheads. In Greece, the production of bronze arrowheads began in greater numbers in the Middle and Late Mycenaean Periods. The bronze arrowheads of antiquity are manifold and could form different shapes. The three arrowheads shown here come from the Scythian cultural area. Left picture: Scythian arrowhead in lancet shape with sideward pin 690 - 200 B. C.
Middle picture: Three-winged Scythian arrowhead with sideward pin 690 - 200 B. C.